The Chevrolet Corvette has been an engineering masterpiece since it was first conceived. Designed as a flagship, the Corvette has been an outlet for new technology and ultimate performance with each generation. Now in its seventh generation, the Corvette has worn the supercar crown with grace and humility for decades. But that seems to have ended with the most current C7. Born with a new attitude and a fervor to be noticed, the C7 redefines the Corvette’s lineage. Corvette owners want the best, and they have high expectations when it comes to the ride and performance of their ‘Vette when pushing the car hard, either on the track or a back road somewhere. But every vehicle and every component has a limit, and your brake system is no exception. The OE brake system is plenty good for the average driver on an average day. But when you want more from your driving experience, a brake upgrade is an easy decision to make. By upgrading the components of the OE brake system with better pads, lines, and rotors from DBA that are still 100% direct fit and completely compatible with all ABS and VSC systems you can start to see your safety and confidence increase almost immediately. DBA rotors incorporate many features that set us apart, and ahead, of our competition. Inspired within Australia’s heartland, DBA developed the Kangaroo Paw cooling system. ระบบระบายอากาศที่จดสิทธิบัตรนี้มีวิธีการที่มีประสิทธิภาพมากขึ้นในการรักษาใบพัดเย็นภายใต้หนักของการใช้เบรก. Using a series of 144 diamond and teardrop patterned pillars (or columns) instead of conventional straight cooling vanes, การออกแบบจิงโจ้ Paw ให้พื้นที่ผิวมากขึ้นที่ช่วยเพิ่มประสิทธิภาพในการระบายความร้อนได้ถึง 20% when compared with most other conventional ventilated disc rotors. As well as providing cooler conditions, the Kangaroo Paw system also provides additional support to the friction face. This enables the rotor to maintain the fine tolerances over the life of the rotor better than a straight vane design, ซึ่งสามารถ "บอลลูน" และบวมระหว่างใบพัดเมื่อการดำเนินงานที่สูงเสา temperatures.The จิงโจ้ Paw มีการแพร่กระจายอย่างสม่ำเสมอทั่วใบหน้าแผ่นดิสก์และทำให้ใบพัดแข็งแกร่ง, more stable and more consistent in operation. Usually only found in high-end performance discs, XG-150 is a unique formulation developed for all DBA products. 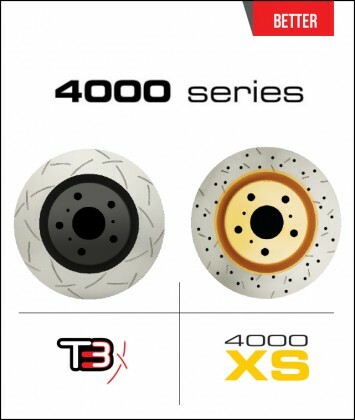 High carbon alloyed iron may look like regular iron found on standard discs, but DBA’s unique XG-150 iron formula has been tested the world over to the absolute limits of braking punishment. DBA’s 4000 and 5000 Series rotors also incorporate DBA’s TGHP Thermo-Graphic heat paint markings that change color at specific temperature thresholds. By monitoring these markings drivers can check their braking performance quickly and easily. DBA uses a process called thermal stability profiling (TSP) on all 4000 and 5000 Series discs manufactured with XG-150. TSP re-aligns the micro-structure of the iron increasing density, resistance to extreme heat and reducing disc wear. Most discs on the market are Found to be ‘ground’ finished, but every DBA disc endures a special Cubic Boron Nitride (CBN) fine-turn process. The quality of the finish is measured as a surface roughness (engineering term Ra) in microns. One micron is 1 millionth of a meter. DBA rotors are machined to a maximum of 1.8 Ra or less. DBA delivers added value to ensure their products are received in perfect condition by covering each and every rotor in a moisture proof, corrosion protective dual layer package. The premium paint coating found on all DBA rotors in non-friction areas ensures corrosion protection. 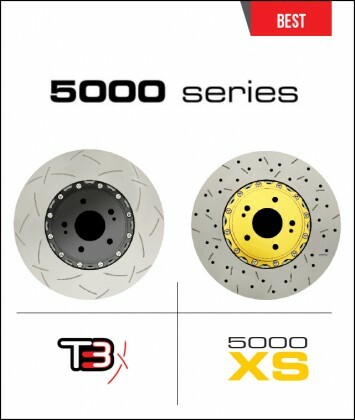 DBA rotors maintain their originality, aid vehicle Appearance and last longer even when exposed to the elements. *Grayed out parts are not available for this vehicle.